On Thursday, voting will begin in a pivotal alumni trustee election that will mark the ouster of all alumni-elected trustees who presided over the Sandusky scandal. 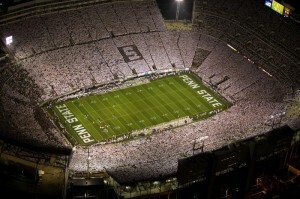 It will be a proud moment in Penn State’s 159-year history. But throwing them out of office isn’t enough. We need new leaders who’ve demonstrated they have the skill and experience to fundamentally change the way the Board of Trustees operates. Nobody else has worked harder during the last two years to force the board to be more accountable for their failures in November 2011. And nobody else has been more successful with making trustees operate more openly and transparently. Uncovered hundreds of documents related to the Sandusky scandal, including many that that show Louis Freeh’s investigation was not independent. Forced the administration to release trustee conflict of interest disclosure forms, so that anybody can keep an eye out for potential violations. Founded the Penn State Sunshine Fund, which has raised more than $26,000 for transparency-related legal efforts. Won a major court battle that made records of some trustees subject to Pennsylvania’s open records law. Despite those accomplishments, the alumni community remains deeply divided, and I want to help reunite us once and for all. That’s why I will make it my top priority to release all records related to the Freeh investigation. Seeing the records firsthand will allow us to decide for ourselves whether his conclusions have merit, and pave the way for many of us to finally begin to heal. But we cannot focus on the past forever. Other challenges beg for our attention, including record tuition that is too expensive for even the most committed Penn Staters. We should immediately rethink the way we set the price of a Penn State degree by providing discounts for alumni and need-based tuition credits. We should also push to expand the university’s private loan program and lower its 6 percent interest rate. And we should convene a task force of trustees and administrators to work toward a long-term goal of providing a free education for students whose families earn less than $60,000 a year. Finally, we must honor Joe Paterno’s decades of service to Penn State in a way that conveys our vast appreciation. That’s why I support the formation of a commission that represents the broader alumni community to decide the best way to honor his legacy. Such an important decision should not be left to a handful of administrator or trustees. For two years, I’ve worked for the reform and transparency that we demand. But I can only do so much from the outside. On Thursday, send a message that you support a different kind of trustee. Vote for Ryan Bagwell, ballot position #5.